Adventitious carbon may be removed by argon sputtering. Use lowest energy argon beam available (e.g. 200eV or 500eV) or argon clusters to prevent/minimize chemical damage to the underlying material. 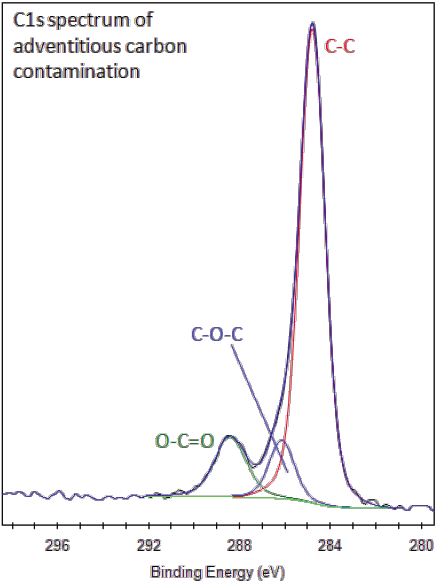 Adventitious carbon contamination is commonly used as a charge reference for XPS spectra. 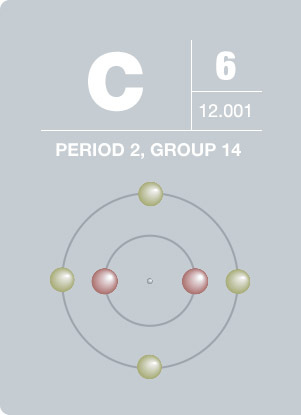 C1s spectrum for contamination typically has C-C, C-O-C and O-C=O components. The C-C component may be set to a binding energy of 284.8eV, by default. Not always a valid charge reference value (e.g. 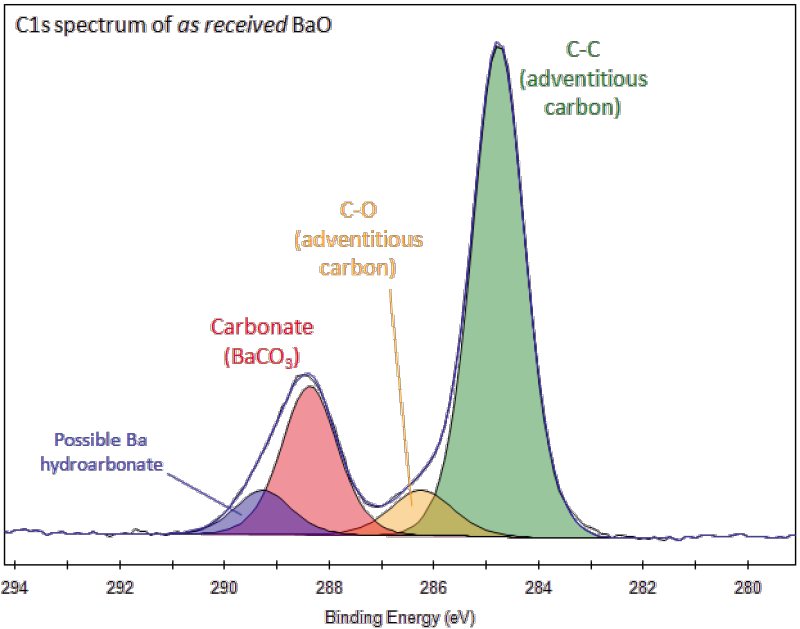 C1s peak for adventitious carbon on native oxide of aluminium appears at ~286eV). A few nanometers of adventitious carbon on a sample can dramatically affect the survey spectrum of that sample. Quantification may be inaccurate when using peaks of significantly different energy. The intensity of higher binding energy peaks may be reduced relative to their counterparts at lower binding energy. For example, the Na1s peak (binding energy=1071eV) may be weaker than expected, or completely disappear, but the Na KLL peak (binding energy=497eV) remains strong. Inelastic scatter of electrons through the adventitious carbon layer may cause a large change in background shape when compared with the spectrum from a clean sample. 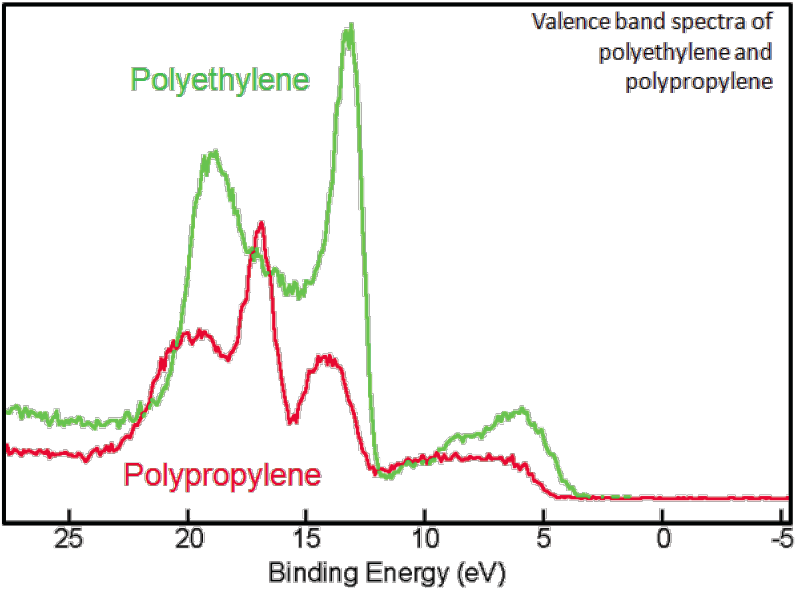 Acquisition of valence band can be useful for “fingerprint” identification of polymers. Particularly useful in cases where C1s XPS data cannot easily distinguish between polymers, e.g. polyethylene and polypropylene. Some polymers are sensitive to prolonged X-ray exposure. Different polymers have different degradation rates. Minimize analysis time where possible. C1s regions for polymers can often have acquisition times of <1min. Acquire regions of interest first (e.g., C1s, O1s) before running survey, if possible. If the sample surface is chemically uniform, it may be preferable to rapidly acquire data from many points and then integrate the data post-acquisition. Overall acquisition time is then the sum of every point (giving good signal-tonoise statistics) but the amount of X-ray damage at each individual is negligible. Good method for analyzing self-assembled monolayers. Charge neutralization will be required. Argon cluster source preferred for depth profiling of polymers. Polymer materials containing F or Cl are often degraded by Ar+ monomer sputtering with loss of F or Cl. Not always reliable, possibly changing with nature of the surface hydrocarbon, film thickness and nature of the sample. 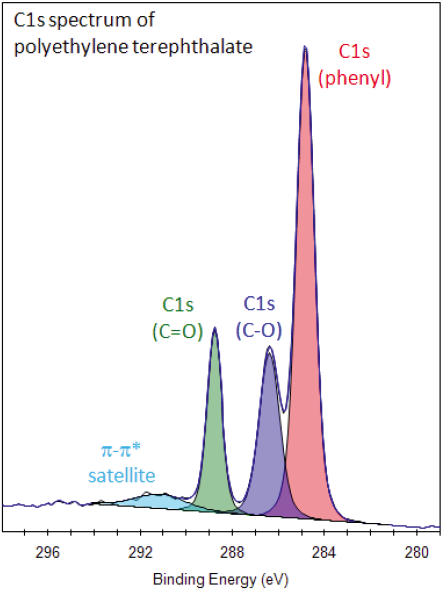 C1s spectra for polymers tend to have symmetric peak components. Extended delocalised electrons in a sample (e.g. aromatic rings) can result in satellite structure, several eV to higher binding energy of the main peak. π-π* satellite is seen 6eV from main C1s peak in polyethylene terephthalate, for example. π-π* satellite can be confused with potassium’s K2p3/2 peak. Acquire C1s, C KLL and valence band regions. Maximizes ability to distinguish between sp2 and sp3 carbon. C KLL acquisition conditions: Pass energy=100eV, step size=0.5eV, 100 scans, scan range binding energy=1190eV-1246eV. Charge neutralization may be required, especially for functionalized graphene/graphite or diamond. The C1s spectrum from a sample with high concentration of sp2 carbon will have a broad, asymmetric tail towards higher binding energy. One or more satellite features, several eV from the main C1s peak, will also be observed in samples with high sp2 concentration. 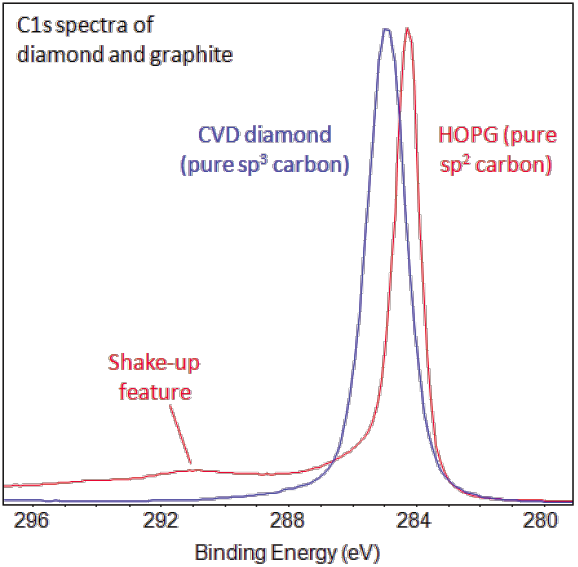 For high concentrations of sp3-bonded carbon, the C1s peak will have a more symmetric shape and will also be slightly shifted to higher binding energy. 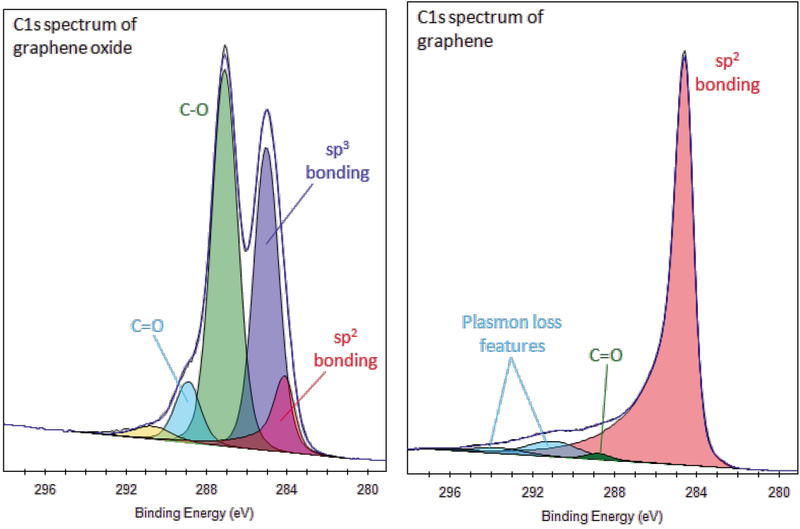 Functionalized graphene will have a complex C1s spectrum, containing sp2 and sp3 components. Fit the sp2 component with asymmetric shape (preferably derived from a real graphite or graphene sample), including symmetric loss peaks where necessary. The sp3 carbon and functionalized carbon should be fitted with symmetric peak shapes. The sp3 carbon peak should be 1eV to the higher binding energy side of the sp2 component. It is generally not possible to uniquely peak fit mixed sp2/sp3 spectra. Analysis of the X-ray induced C KLL Auger peak can help distinguish these bonding states in a semi-quantitative manner for non-functionalized samples. 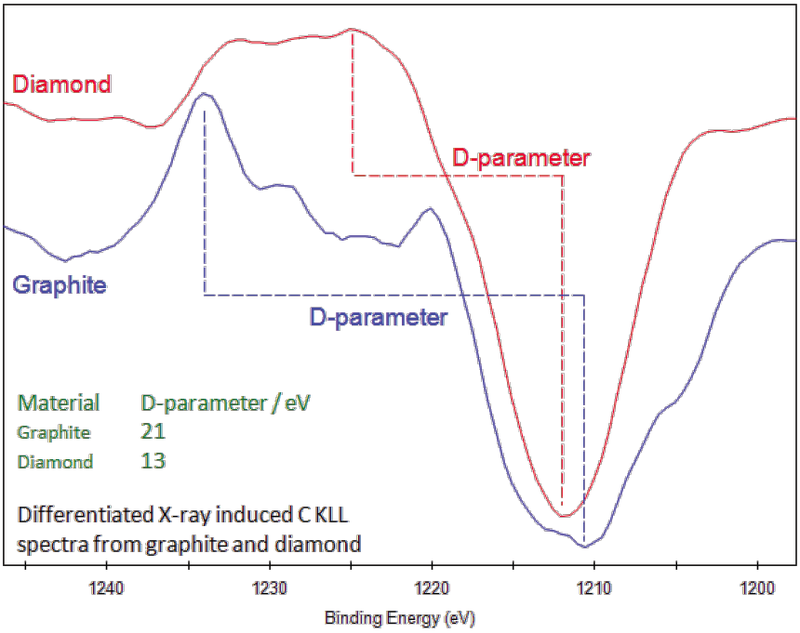 The differentiated form of the C KLL spectrum allows measurement of the D-parameter, which gives an indication of the relative amounts of sp2 and sp3 carbon. Measure energy separation between maxima and minima in differentiated C KLL spectrum. For functionalized carbon samples, caution must be exercised if using this method. In the presence of ruthenium, collect full Ru3d and C1s regions (270–300eV), making sure both Ru3d5/2 and Ru3d3/2 components are acquired. Metal carbides may be inadvertently formed during argon sputtering of metal-containing compounds, e.g., oxides, nitrides and borides. Use lower energy Ar+ beam for depth profiling to minimize this effect. Metal carbonates are often observed on as received metal oxide samples. As received metal oxide and metal carbonate surfaces may also have hydrocarbonate or carbonate hydroxide components. C1s component for hydrocarbonates tends to be shifted to higher binding energy relative to carbonate. For Group I elements, the binding energy of the C1s carbonate peak has been found to increase with increasing ionization potential. C1s carbonate component overlaps with ester (O-C=O) peak (typically present in C1s spectra of adventitious carbon). Ester component tends to be of a similar intensity to C-O in adventitious carbon spectra and much weaker than C-C component. Metal carbonate peak tends to be narrower than typical ester peak. Check ratio of carbonate C1s intensity relative to metallic species, e.g., in a CaCO3 sample, the observed [Ca] / [CO32-] ratio should be 1. Direct overlap between Ru3d3/2 and C1s peaks. Use Ru3d5/2, which does not overlap with C1s, as a guide for any peak fitting. Intensity and binding energy of Ru3d3/2 peak is set by the Ru3d5/2 peak, according to the spin-orbit splitting and ratio. Remainder of intensity under at Ru3d3/2 energy can then be attributed to carbon. Carbon has been known since ancient times when it was produced by burning organic material in the presence of insufficient oxygen. Four allotropes of carbon are known: amorphous (e.g., charcoal and soot), graphite, diamond and fullerenes. Carbon’s small size allows it to form multiple bonds with many other small atoms, including carbon atoms, and is prevalent in a large number of chemical compounds. Carbon-based compounds are the basis for all living systems and comprise the structure of fossil fuels in the form of hydrocarbons. Several carbon isotopes are important. The International Union of Pure and Applied Chemistry designated the isotope C-12 as the basis for atomic weights, while the unstable isotope C-14, with a half-life of 5700 years, is used for carbon dating.